I knew there wasn’t going to be batting practice; this was a 12:35pm game, and the A’s and Astros had played 11 innings the night before. Thankfully, though, both teams were playing catch when I entered the stadium . . .
. . . so I figured I’d have a couple of chances to get a toss-up. After heading down toward the front row and standing around for a minute or two, I saw a ball get thrown wildly and roll onto the warning track. Take a look at the following photo — see it there against the little side-wall that juts out? “Oh, so you’re one of THOSE guys,” he said. The player on the right is Brett Wallace. Any idea who the other guy is? In general, I’m pretty good at recognizing major leaguers, but Great God Almighty, I have no clue with the Astros. Talk about a bunch of no-names! I think I’m more famous than half the team, which is pretty sad for them. Do you remember the nice conversation I’d had the day before with Astros bullpen catcher Javier Bracamonte? Well, I caught up with him again. This time I gave him three different flavors of BIGS Sunflower Seeds . . .
. . . and ended up answering a bunch of his questions about the helicopter stunt. He’s SUCH a nice guy, and in case you’re interested, he’s on Twitter. After chatting for a while with Bracamonte, I got a visit from my friend and fellow ballhawk Spencer. Here’s a photo of us . . .
. . . which was taken by the Astros’ other bullpen catcher, Jeff Murphy. Can you spot the BIGS Seeds in the following photo? I’d assumed that Bracamonte had taken those sample packs into the clubhouse, so it took me by surprise to see them sitting with the other equipment in the bullpen. A little while later, Murphy did a catching drill with Carlos Corporan . . . If you want to catch a foul ball, that’s where you should sit for left-handed batters. Anywhere in Row 1 of Section 219 is pretty much ideal, and those seats are almost always empty. Just walk up to the ticket window on the day of the game and ask for it. 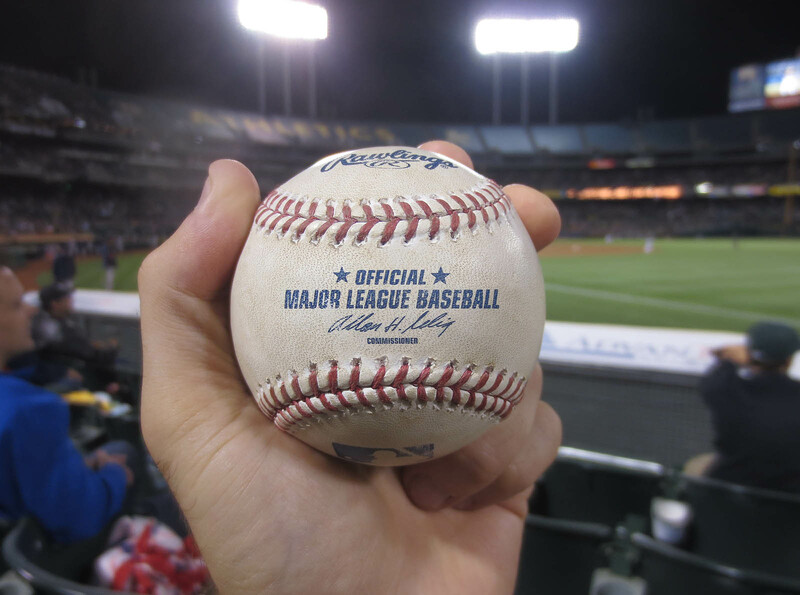 If you sit there for an entire game, it’s more likely than not that you will snag a foul ball. For right-handed batters, Section 215 is the place to be. Be advised that the ushers do check tickets in those spots, and since it’s always so empty, there’s no way to sneak in there. They’ll see you, so just buy a ticket. They’re not that expensive, and the A’s could really use the money. Anyway, this was my view of the field . . . The photo above shows Nate Freiman (6-foot-8) standing next to Jose Altuve (5-foot-5). Given my fascination with tall people, you can imagine how much that made me smile. Now, as for the foul ball that I caught . . . I was promptly congratulated by the nearest usher who handed me a “Foul Ball Club” card, which I eventually filled out. Here’s the front of it . . .
By the way, this is the ball that I’ll be offering in the end-of-season auction to benefit Pitch In For Baseball. I think it’s better than the Josh Reddick strikeout ball that I got the day before because this one was thrown by Sonny Gray in his first major league win. Of course, there’s no telling what kind of career he’ll have, but c’mon, that’s pretty cool. Then I hurried through the concourse for 100 to 150 feet . . . This is how I stay fit during the season. Seriously. I was hoping to catch another foul ball — or maybe six more foul balls — but nothing else came near me. The A’s won the game, 5-0. I took a photo of the players and coaches spilling onto the field . . . I had talked to them for a while before the game. Really nice people. Even though I only snagged five balls in two days and had miserable luck during the games, I was sad to leave. Watching baseball in Oakland is a unique experience, and I probably won’t be back for a while. • 489 balls in 66 games this season = 7.41 balls per game. • 54 balls at 8 lifetime games at the Oakland Coliseum = 6.75 balls per game. Brandon Barnes is the player with Wallace – can’t miss his tats. I wish I had been able to get one of the Astros balls, so I guess I will have to go to a game that they aren’t hitting BP at. They’ll be in Oakland 1 more time this year, so hopefully things work out then! Glad you were able to get at least one foul ball while you were visiting. Were very many hit into the 2nd deck? And that security guard by the Astros bullpen, Mark, is a great guy! Definitely my favorite stadium employee in Oakland! That is Peacock’s signature on the far right of the ticket; sad that he’s actually one of the more well-known Astros, eh? There’s more talent on most AAA teams. nice zack can u check out my newest post please? Brandon Barnes was the player with Brett Wallace. I can agree with your comments on the Coliseum. I got two baseballs there last year in right field when I went to see my favorite team the Rangers play there. Something is different about the Coliseum like you said. I’m not sure what it is but I feel like you can get “closer” to the players there than many other parks. Especially with the bullpens down the line and I ended up splurging for Diamond Level tickets and got a few autographs when the Rangers came out to warm up. As for Bracamonte he is indeed a pretty cool guy. I saw the Astros play in Tampa last month and he was frequently walking back and forth between the dugout and bullpen and stopped to talk with a few Astros fans down by the bullpen. Even though I’m a big Rangers fan I’d love to see the Astros become competitive once again even though it’s still very strange to know that they are an AL team now. One final note – I also got a 50th anniversary ball from the Astros last month at Tampa. Caught it on the fly during BP. It was my 25th lifetime ball and certainly a nice one for a “milestone” for me. It’s amazing how nonchalant we’ve become about seeing you catch foul balls (you make it look so easy), but THAT’S AMAZING. Nicely done. You are really the king. On the other hand, I just saw the Yankees at Petco and they could care less about their fans… They had NEVER been to Petco, hadn’t been to San Diego in 11 years, were 3,000+ miles away from home and I only saw Mariano sign autographs. There were 1,000s of fans at BP who didn’t even get a wave or nod. Shameful. You don’t need to avoid BP. Just focus on the pitchers when they warm up and/or try to get a ball from the bullpen bag. There were VERY few foul balls in the second deck at this game — I think just three all day. Thanks. One of the *more* well-known Astros? Yikes. I miss Biggio and Bagwell. I would love to but (a) you didn’t provide a link and (b) I’m way too busy trying to catch up on my own life/stuff to read anyone else’s blogs right now. Sorry about that. Cool. Glad to hear that someone else agrees with me and had a good time there. Hey Zach nice post. I’ve always wanted to visit the Coliseum. Have you ever been to Miller Park in Milwaukee? It’s a great park! If you have ever been there, do you have any ball snagging tips? I actually just got your book, The Baseball but haven’t started reading. Please come by my blog Bleacher Boy. Come and see a kid’s view on all things baseball. I’m trying to get some baseballs of my own, and I was just wondering, how do you get toss ups? The stadium I have access to is Citizens Bank Park, so anything relating to that would be even more helpful. It’s nick Horowitz. I was at the Yankees game on Monday vs the Angles, and caught 6 balls! And I met Mike trout, and Josh Hamilton. And in the middle of the game, Josh Hamilton came up to me and handed me a signed ball! Also, I was informed by bigs I was one of the winners of the contest, and one a bigs adventure shirt! It was great hanging out, but yeah, I wish we’d had more time. It was actually the Red Lion Inn. I think I may have said “Red Roof” at one point accidentally. Hope tos see you again soon. Yeah, I’ve been to Miller Park (and every other current stadium). “The Baseball” has a section devoted to Miller Park tips in Part 3, so check that out and also read my blog entries from when I’ve been there. That’ll give you all the info you could possibly need. There’s way too much info/advice for me to cram into a blog comment, and I’ve already written it all down anyway. My book “The Baseball” (which you can go read for free at a library) has an entire chapter called “How to Get a Player to Throw You a Ball.” Read that, apply the strategies to Philly, and you’ll be set. Nicely done! That’s a very impressive total. Very cool about meeting the players and winning the contest. Congrats. That puts me on 25 life time balls! Thanks, just got the book and is really helpful! I got my shirt!!!! So awsome! Sorry for the slowwwww reply, but I’m glad you got it. O.co Coliseum would be heaven for me if I lived in the Bay Area. Their tickets are $5 for a large number of the seats. And no, you don’t get closer to the players, the foul territories are HUGE at this stadium. It feels more intimate because there aren’t as many fans in the stadium.